As the summer season starts to shift to autumn, the color and hue of the landscape and scenery begins to change as well. While preparing for cooler weather and all that coincides with that, we want to make sure to reserve time to enjoy one of the most beautiful times of the year. There are some wonderful events right here in Stowe that enhance the experience of autumn in Vermont. Coming up September 27th, from 1-5, join the Stowe Land Trust for a fun and special day, celebrating 28 years, at the iconic Adams-Bryant property, in Nebraska Valley. 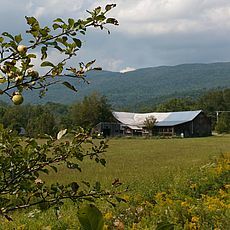 Have some pie & ice cream, bring your apples to make applesauce, and hear from the Vermont Land Trust's Director of the Farmland Access Program, Jon Ramsay, speak about the return of the family farm to Vermont communities. Afterward, join one or more of the outings and activities! For more information and to RSVP, please visit the Stowe Land Trust website. Then, on Sunday, October 11th, The Stowe Mountain Bike Club is having its 5th Annual Leaf Blower Classic. A day of mountain biking for all abilities and ages - even for the kiddos. After an afternnon of riding on Stowe's world class mountain bike trails, enjoy a catered meal, prizes and games around the fire pit, at the Town and Country Resort. For more information and to reserve your spot, go here. So, enjoy this gorgeous time of year in Stowe, and around the state; and check out some of the other events and happenings.